So, you've got your spiffy new Motorola Droid phone from Verizon. Now what? When it comes to applications, the Android ecosystem is pretty different from that other far more controlled alternative. Sure, the Android Market may not have 100,000 options just yet. But it does offer plenty of powerful programs -- somewhere around 10,000 total -- and, in a refreshing twist, it lets you decide what apps you want, instead of frequently censoring selections for you. See Related: Top 10 Android Apps for Entertainment & 12 Essential Android Games & Top 10 Android Apps for Entertainment & 11 Essential Android Travel Apps. We've compiled a list of 10 top-notch Android apps to help get you going with your Android experience. These are all highly ranked programs that'll be strong starting points as you work to make the most of your new Droid device. After all, the much-discussed turn-by-turn GPS navigation system isn't the only thing out there. Remember: This is only the beginning of the conversation. The Android Market is expanding every day, and there's no end to the interesting options it holds. If you have a favorite we didn't include, add it onto our list in the comments section below. Your recommendation will help other Droid users find even more cool ways to enjoy their new phones, too. UPDATE 7/15/2010: Hey, what was that I just told you about the beginning of the conversation? Nine months after I wrote the article you're reading right now I've just posted an update: Verizon's Droid X: 12 Apps to Get You Started. Catchy headline, huh? If you're a Twitter user and used to the iPhone, the first thing you might notice is that Tweetie isn't in the Android Market. 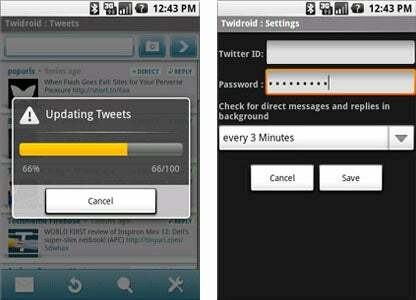 Not to worry, though: Twidroid has your back. The Android-based Twitter app is available in a free and a pro (paid) version. Both of Twidroid's offerings provide most every Twitter function you might need, from the basic -- viewing and sending tweets, following and unfollowing users, viewing profiles -- to the more advanced: saved searches, URL shortening, photo posting, and geo-location support. The pro version adds support for multiple accounts, bit.ly integration, video posting, and a handful of other options. It runs about $5. Twitter? Check. Instant messaging? Check. Our second featured app will keep you connected to all of your IM accounts while you're roaming around with your new Droid. Meebo links multiple IM protocols into a single app that you can always keep running on your phone. AIM, MSN, Yahoo, MySpace IM, Google Talk, Jabber and ICQ are all supported -- and, if you create a Meebo account, you can save a collective log of all your chats that'll be accessible online. The Meebo for Android app is free. 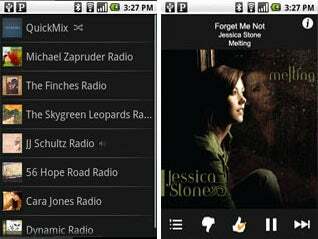 Crank up the tunes on your new Droid immediately by installing Pandora's Android app, available for free in the Android Market. Like its online and on-the-iPhone counterpart, the Pandora Android app lets you listen to personalized radio stations based on your favorite artists or songs. Thanks to Android's multitasking capabilities, you'll be able to rock out while running other apps -- something the iPhone can't handle. File this one under "outlawed on iPhone," too. The official Google Voice for Mobile app fully integrates Google Voice functionality into your new Droid phone. Once installed, you can make outgoing calls from your Google Voice number with the touch of a button, right from your contacts list. 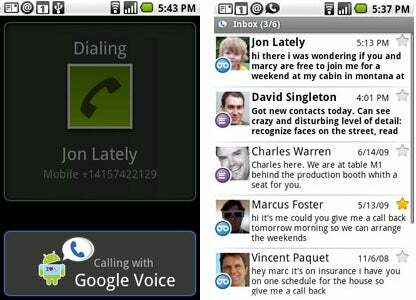 You also gain easy access to voicemail and Google Voice-based SMS messaging. The Google Voice for Mobile app is free to install and use. You do need to have an existing Google Voice account, however, for it to work. Take control of your phone with Locale, one of the coolest apps available for Android. Locale lets you customize your phone's settings based on your location. You could program the app to set your phone to vibrate every time you're at your office, or set it to go silent when you enter the perimeter of your local movie theater. You can get advanced and make exceptions for VIP callers, too.